Energize your Exercise with uplifting and upbeat music by Amy Grant and Mandisa. Affiliate links are used in this post. I received the CDs mentioned complimentary. Opinions are mine. Consult a doctor before trying a new exercise. Are you ready to energize your exercise routine? I definitely need an extra push to get me through the Halloween candy, Thanksgiving turkey and Christmas cookie cravings. So, I was super excited when Family Christian sent me two new CDs to get my heart-pumping. Amy Grant is back with her old school Heart in Motion and has transformed it into In Motion The Remixes album, and Mandisa has compiled her favorites into the Get Up Remix album. I’ve been listening to In Motion and Get Up on the treadmill, the trail and in the weight room. The fast-moving beat will energize your workout plus the lyrics are encouraging. These albums will have you pushing harder, lifting heavier and smiling longer! I’ve created a mini workout perfect for a cold, rainy day or when you have a sick child at home, but you still need to exercise. I’ve paired the exercise routines with some songs from the In Motion and Get Up Albums. I like to do a full-body workout on my short gym days or when my time is limited. This workout will get you sweating in no time plus you’ll burn some calories in the process. Let’s start with some warm-up exercises and pair it with Amy Grant’s Mega Mix. Are you warmed-up? Great! Let’s get Energized! 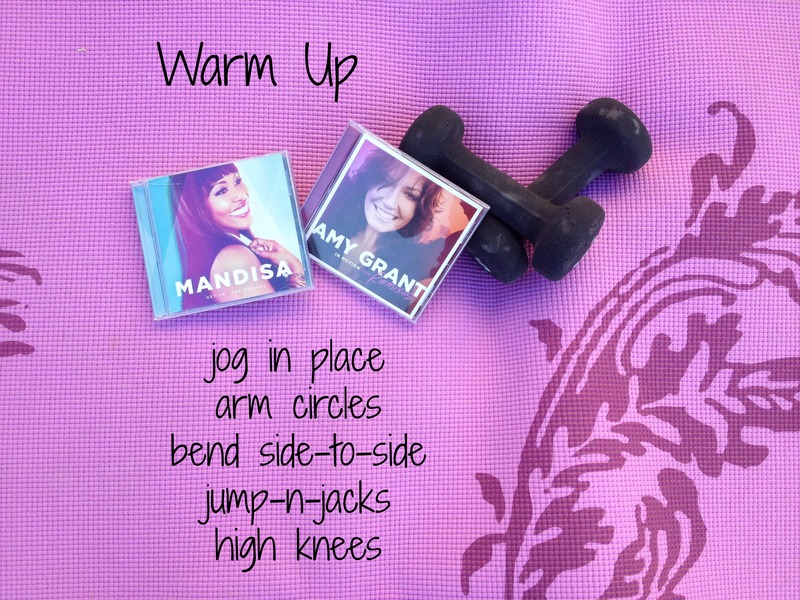 Visit Amy Grant In Motion Remixes or Mandisa Get Up to listen to each song that corresponds with each exercise. Grab your weights, a mat and a water bottle. Do this routine 3x and you will feel the burn! 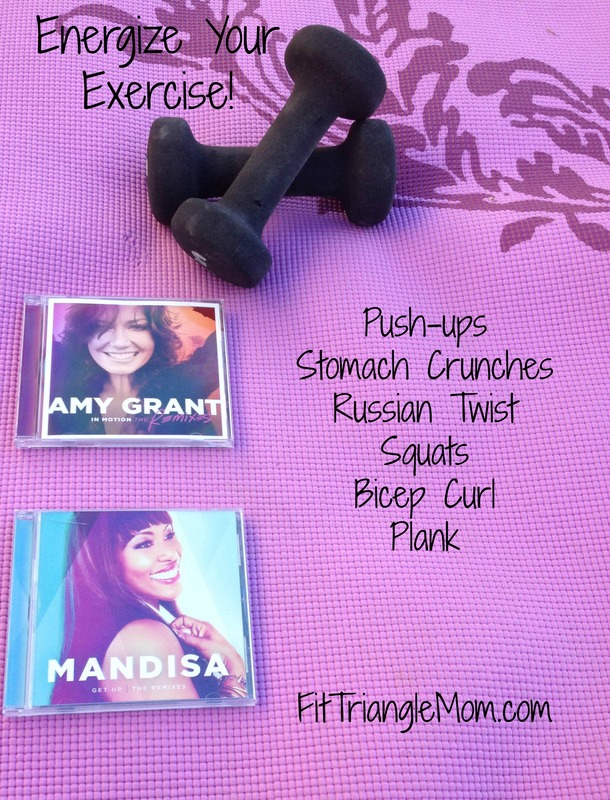 You can purchase Amy Grant’s In Motion Remixes and Mandisa’s Get Up CD or an MP3 version at Family Christian or you can enter to win a copy of both of these CD’s and you’ll always be able to energize your exercise! Comment below and let me know what your favorite exercise is. I love Pilates. Great ab workouts. Thanks for commenting. I loved the original Amy Grant “Heart in Motion” album, so I can’t wait to hear what she’s done with it now. And Mandisa – wow! Hope I win! Thanks for this! You’ll love the new In Motion album. It’s similar to the Heart In Motion version, but with more of a dance mix theme to it. Thanks for commenting. I love to go running. Running is a favorite of mine too. Mandisa’s album is great for running. It is upbeat and uplifting. It’ll push you over the hills. Thanks for commenting. 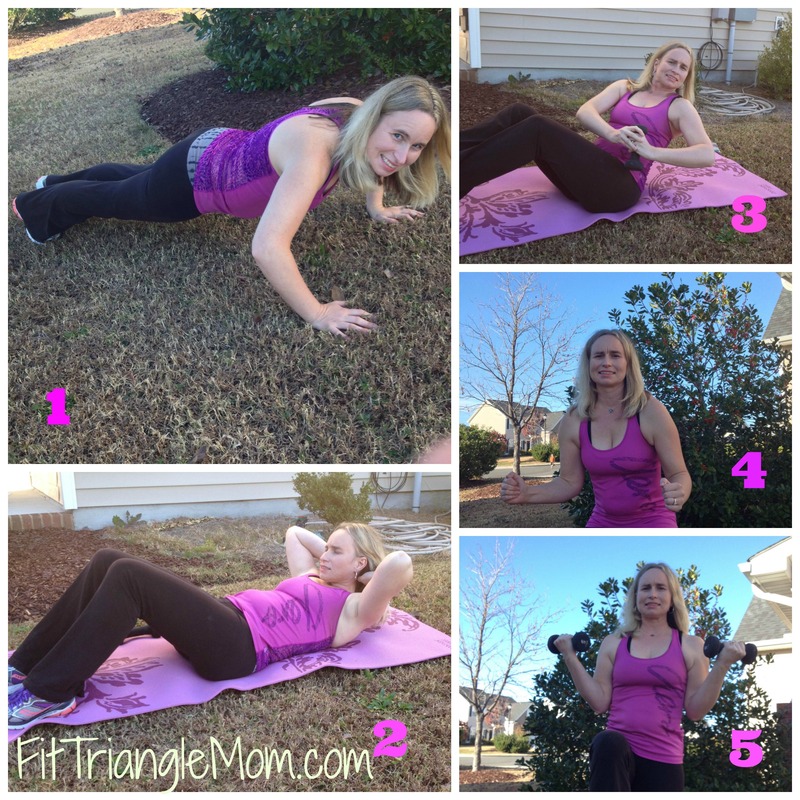 A win-win workout! Exercise for you and your dog. Thanks for commenting. I’m a fan of push presses. Those are effective exercises. You can always feel it the next day. Thanks for commenting. I love running. Mandisa’s songs are perfect for running. Thanks for commenting. My favorite exercise is swimming and dancing. Awesome. Do you swim year round? I love incorporating dance into my workouts. These CDs will be perfect for dancing. Thanks for commenting. I love that you created a workout for the CD. Mandisa’s Overcomer song brought tears to my eyes when I heard it on GMA. Thanks for sharing with #SmallVictoriesSunday! Pinning to our Small Victories Sunday Linkup board and sharing on social media! I love listening to Mandisa when I exercise. Her upbeat and inspirational lyrics keep me going. Thanks for commenting.